According to Google documentation "Dimensions describe characteristics of your users, their sessions and actions." A Primary Dimension is the default Dimension that defines your report; a Secondary Dimension is an additional characteristic that you've added to the report to provide extra information about your visitors. 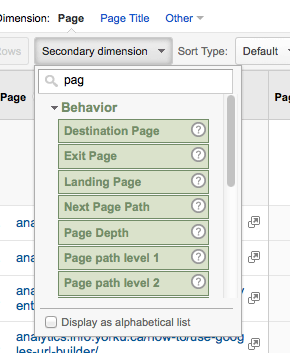 In other words, when you drill down to a report by clicking through Google Analytics' left navigation, the report generated is based on a Primary Dimension. You can add a Secondary Dimension to add another layer of information to your data. This allows you to find out more about the data you are considering. For example, you can add a Secondary Dimension like 'Source' to the All Pages report (Behavior > Site Content > All Pages) to find out what the Source of your visitors is to each URL listed in the Page column. Note: only the Dimensions that can be applied to your report will appear in the list -- those that do not apply will remain inaccessible. Your report will automatically regenerate with the additional information listed.